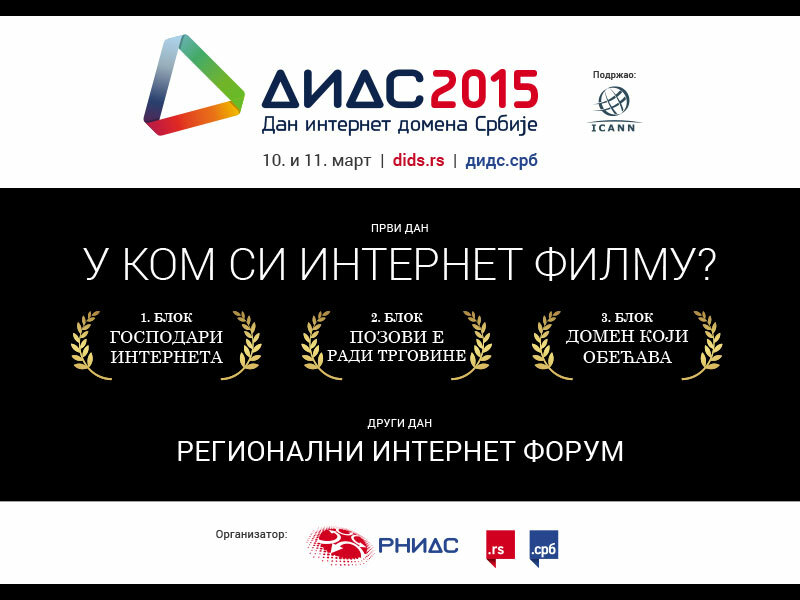 More than 300 visitors have registered for DIDS 2015, the sixth annual conference on the development of the Internet globally and on the .RS and .СРБ domains in Serbia. This year, Serbian Internet Domain Day will be held on 10th March at the Metropol Palace hotel in Belgrade, under the slogan “Which Internet film are you in?”. Those who cannot attend in person will be able to follow the DIDS programme online, primarily at dids.rs and дидс.срб, but also via the RNIDS site and on several other sites belonging to our media sponsors: LiveTV.rs, RTS, B92, Južne vesti, ITdogadjaji.com, MarketingITD.com, Netokracija and Radio Laguna. Online streaming of DIDS begins at 10am and will last until 3:30pm. Questions can be put to speakers via Twitter, using the #dids2015 hashtag.